Last July I taught you the secret of making herb-infused lemonade from scratch, to get that haunting fragrance and flavor without little green things sticking to your teeth. Now you can take elegance one step further, with decorative ice cubes that enhance both the flavor and visual charm of your party beverages. Start with small flowers (or individual petals of large flowers) that you know FOR SURE are safe to eat. Choose from the list below, then wash and dry each one carefully. 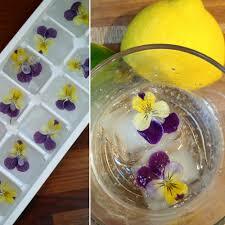 Fill your ice cube tray halfway with water, then add one item to each spot. Freeze just until the flower is held firmly in position. Fill the tray the rest of the way, and freeze until solid. If you’re not using them today or tomorrow, remove the cubes from the tray and store in a freezer bag until the party. Why a two-step freezing? Because if you fill the trays completely and then add the flowers, the flowers will float to the top and the petals will suffer freezer burn. Whatever accentuates the drink, in both taste and visual appeal. 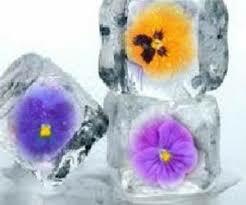 Lovely small edible flowers include violas, tiny rosebuds, gem marigolds, dianthus, and the flowers of all herb plants. Think about what flavor will enhance the taste of the beverage. Violas and roses have a slightly sweet, floral taste. Gem marigolds taste like the citrus fruits they’re named for: orange, lemon, or tangerine. Dianthus is sweet and spicy; some varieties taste exactly like cloves. Herb flowers taste like you would think, like their parent. So, put the tastes together in your mind. How about clove dianthus blossoms in a deep rose color for your homemade lemonade. Or orange gem marigolds in white wine spritzer. Or the tender blue of rosemary flowers for a subtle richness to iced tea.